Posted on September 23, 2016 by Kaylie W.
Described as “the quintessential novel of the Lost Generation,” The Sun Also Rises is one of Ernest Hemingway’s first masterpieces that established him as one of the greatest writers of the twentieth century. Set in Paris in the 1920s, the novel explores the disillusionment and anxiety of the “lost” post-World War I generation. The story follows the unfortunate Jake Barnes, the ostentatious Lady Brett Ashley, and a disenchanted group of American and British expatriates on their journey to rediscover their purposes in life. From parties in Paris, to a fishing expedition, the group eventually finds themselves in Pamplona, Spain during a wild fiesta and bull-fight. The group’s encounters throughout the novel perfectly reflects the Lost Generation’s moral conflicts, spiritual disenchantment, unrealized love, and most of all, the tragedy of lost hope and dreams. 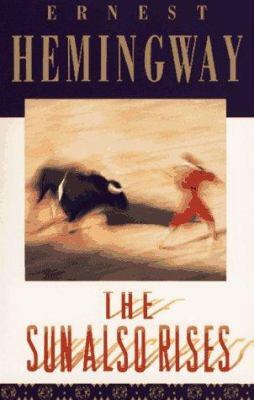 The Sun Also Rises was my first Hemingway book, so my expectations were quite high, especially because Hemingway is widely known as a literary genius. Upon first look, I personally felt that the novel was quite uninteresting. The characters seem to do nothing but drink and quarrel constantly. Although the writing is simple and very easy to understand, there is no plot and no climax. Although the group does journey outside of Paris and explores Spain, they ultimately end up exactly where they are when the book starts, stuck in Paris and wondering when love and adventure will find them. However, upon closer examination, I realized that this was Hemingway’s sole purpose, to portray the hopelessness and despair of the Lost Generation, men and women who served heroically in the war and returned only to find that they no longer had a purpose in life. Just as the title implies, the sun rises every day, and the novel’s characters repeat the same routine of drinking and partying and wandering aimlessly every day. In retrospect, while the writing could tend to be lackluster in some parts, the book was quite enjoyable, and I can now appreciate the genius that Hemingway was behind the novel. He flawlessly depicts the Lost Generation and evokes the same feeling of confusion and aimlessness that the people during the post-World War I age experienced through his words, truly making The Sun Also Rises a literary masterpiece that should be experienced by everyone. The Sun Also Rises is available for checkout from the Mission Viejo Library. It is also available to download from Overdrive. This entry was posted in Book Reviews and tagged classic, disillusionment, expatriats, Fiction, post-war by Kaylie W.. Bookmark the permalink. This review is extremely well-written and insightful. If I were to have read this book before reading this review, I may’ve missed the overall metaphor of the Lost Generation’s hopelessness; thankfully, I’ll be able to look deeper into Hemingway’s artistic decisions when I read this and already be aware of what the book is trying to accomplish. I’m not into historical fiction, but I will consider checking this book out!